Home Style Scout Announcing…the Winter 2013 Issue! In the world of weddings, the Mason jar is definitely having its moment. Whether it’s bursting with pretty wildflowers or hanging from a tree branch with a burning candle perched inside, these old-fashioned glass numbers have become a resounding symbol of an event style brides have coveted for a few years running—shabby chic, vintage-inspired, DIY. 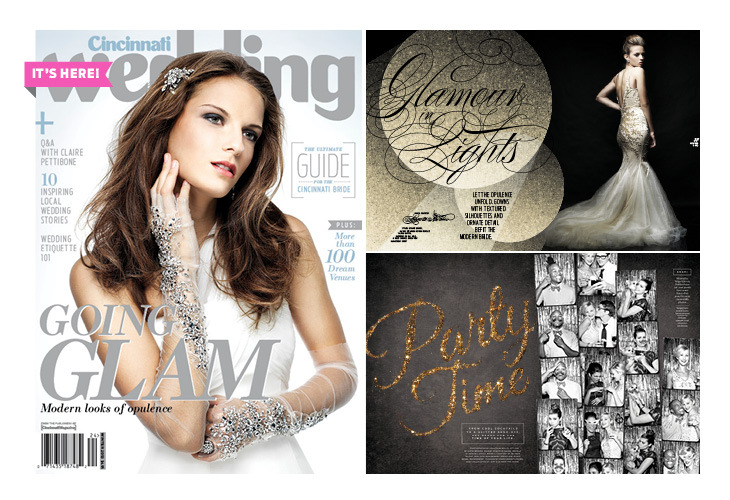 It might come as a surprise, but we are saying so long to shabby chic in this issue of Cincinnati Wedding. Don’t get me wrong: We love the Mason jar and the handspun wedding it inspires as much as the next bride. But after glimpsing the latest collections during Bridal Week, where designers unveiled gowns more opulent than ever, we thought it time to shift the spotlight to a time-honored bridal fashion tradition: glamour. Modern glamour, that is. For our fashion feature, Glamour in Lights, we went into the studio with photographer Annette Navarro to capture today’s glam bride against backdrops of both black and white. Her look is dramatic, but not necessarily over-extravagant. She is stunning in luxurious fabrics, layers of texture, ornate and artistic embellishments, and sparkling jewels. Because weddings have become personalized, there’s no reason a bride can’t combine a glamorous look with some sweet DIY details (as I said, we still love the Mason jar). In Making It Yours, we share some dos and don’ts of creating an event that is uniquely you. Whether you envision an extravagant affair or a rustic, DIY soiree, we hope you enjoy this issue—and every moment of your wedding-planning journey.